You wake up in a strange room with no idea how you got there or what is going on. The only clue is a note telling you to use your brain to unlock the next 30 rooms, so you trundle off through the door, thus starting your Mystery IQ Test, a puzzle game by Entertainment Forge. Use the [arrow] keys to move and [spacebar] to interact with objects. 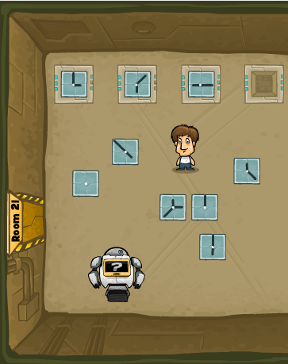 There are three difficulty levels with different point systems, but no timer, so you can relax and try to figure out the puzzles at your leisure. However, you start with an IQ of 80 and the number can go up or down, depending on your performance – solving puzzles without hints awards more points, and you forfeit a whole bunch of them if you ask to be shown the solution. The level design is simple, clean and friendly. The puzzles are varied and will exercise your linguistic, spatial and logical intelligence, which means they stay interesting and stimulating throughout the game. They are a little on the easy side, though, so you might want to choose the highest difficulty straight away. In any case, one good thing about a game which claims to measure your IQ is that you have a strong urge to beat it; every solved puzzle feels like a tiny victory, and you finish it with a smug smile. That'll show those elitists at Mensa who didn't want to let you in their silly club! Mystery IQ Test Walkthrough now available! Take the tile nearest to you (the one that looks like a clock showing 12:25), put it in the slot, then walk on the tiles which spell out "emitemit"
Write with your keyboard "Mystery IQ Test"
Put tiles numbered 4, 3, 2, and 1 in the slots in that order, then walk on the tiles marked "43214321"
Take the tile with the number 9, put it in the slot, then walk on tiles that spell out "Darkdark"
Sadly, the questions do not change between difficulty modes, only the scoring. The solution for number 7 is not entirely correct. Any number other than 8 will work, as the loop you need to break is the counting. It has nothing to do with the loops of the digits themselves. Thanks! I noticed that myself earlier today, but didn't get around to changing it. Well spotted :). Anyone follow the logic in room 19? The rest made perfect sense but that one was odd. I found it boring. If it was just a normal puzzle game I wouldn't expect more, but since it IS called an IQ test I thought it would be more of a brain scratcher. Only one symbol on the floor is flipped relative to the symbols over the doors. The button flips the image, thus suggesting that you look for the flipped floor tile. I'm playing this between activities, and I think I'm getting downgraded for taking a long time. Is there a way to pause the game while I'm not actually looking at it? It seems like it should warn you if you're being timed. That are realy stupid Aliens. 100 is by definition the only result that they can get. 138! First time though on hard. So I'm almost a genius, right? having issues to get the game to load. it will play the 'add'then will say like, 60% loading... then just lock me at a white screen. no buttons nothing. is weird and probably osmething incredibly stupid. There's no point on offering the game in different languages when the translations don't take into account the logic of some puzzles. Check our Support FAQ for how to resolve this. 144 on Challenging, after I found the pause button :P.
158 on hard. Without cheating, one hint though. What is the maximum? I replayed on hard as fast as I could, finished at 170 - 3 points per level, I guess that's the maximum. So 158 is very good indeed :). It's not 3 in room 29 because of the amount of flashes, but because it's room 30 without the 0. Detail matters. I found the game very entertaining. for some reason when i type the name of the game the door won't open in room 22..